Add Prefab Manager Tools -> GPU Instancer -> Add Prefab Manager Drag and drop the prefabs you want on the Add button. 2. Thats all. Your prefabs/details/trees will now be rendered with GPUI. In the Inspector window, you can click the button at the top-right corner to get detailed information about the settings of the manager you just added..
Below are the sections you will find in the Prefab Manager. The Scene Settings section contains scene specific settings like camera selection and global culling settings that effect all the prototypes in this manager. 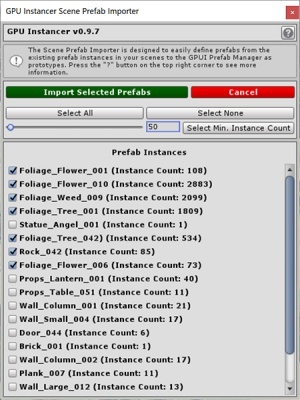 Registered Prefabs shows the list of registered prefab instances that are currently in the scene. These instances will be rendered with GPU Instancer. Prototypes show the list of objects that will be rendered by GPU Instancer. To modify the settings of a prototype, you can click on its image. Add: Click on this button to select a prefab from your project and add it as a prototype to the manager. 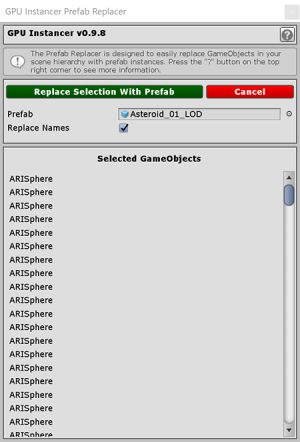 You can also drag and drop a prefab, a prefab instance or a GPUI prototype scriptable object on this button; in all these cases the referenced prefab is added to the manager. You can take a look at this section of the Best Practices Page to see how you can add multiple prefabs like this. Please note that you can also use the Scene Prefab Importer tool to create a Prefab Manager with the selected prefab instances in your scene. The following settings can be edited for each individual prototype. The runtime settings that you can find here can be used to change the runtime behavior of the prototype instances. If you enable runtime modifications, the instances can be added, removed and/or updated during runtime. These modifications can either be done through the GPU Instancer API, or automatically from the manager. When you click this menu item, GPU Instancer will create a Detail Manager for each Unity terrain that you have in the scene. Please note that this menu option becomes available only if you have at least one terrain in the scene. Below are the sections you will find in the Detail Manager. The Scene Settings section contains scene specific settings like camera selection and global culling settings that effect all the prototypes in this manager. You can also easily switch to the Unity terrain that this manager is responsible for to paint details on the terrain. You can also set and unset the terrain connection with this manager from here. Please note that after you add the Detail Manager, it is recommended to add/remove/update detail prototypes on the terrain from the manager rather than directly on the terrain object. Paint on Terrain: This button can be used to navigate to the Unity terrain component that this manager is referencing. 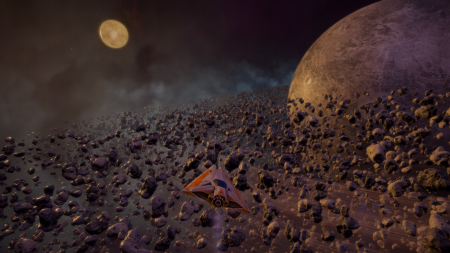 Details should be painted on the terrain using Unity's native tools as usual. Detail data on the terrain will be automatically detected by GPU Instancer. GPUI also adds a script on your terrain which will show you a button to go back to the manager that is responsible for that terrain. When you are done painting, you can use the Go to GPUI Detail Manager button to come back to the manager. 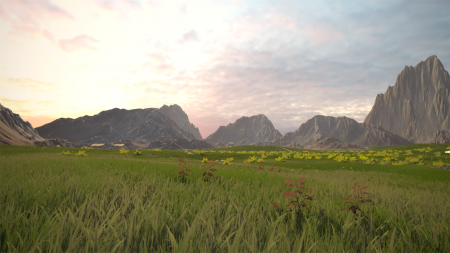 Unset Terrain: This button will severe the connection between the Unity terrain and this manager. You can use this to effectively disable GPUI's rendering of the terrain. It can later be enabled again by using the Set Terrain button. Use Occlusion Culling: Toggles occlusion culling globally for all the prototypes in this manager. By using occlusion culling, the prototypes that are not actually visible at runtime will not be rendered. This will increase rendering performance depending on the amount of occluded geometry, and since terrain details are usually quite high in instance counts it is usually very good to have it on for detail instances. Please note that occlusion culling may lag if the FPS falls to extremely low levels. If this is a possibility, it could be better to turn it off. Please also check the Best Practices section on occlusion culling. These settings are applied to all the detail prototypes defined in the manager. 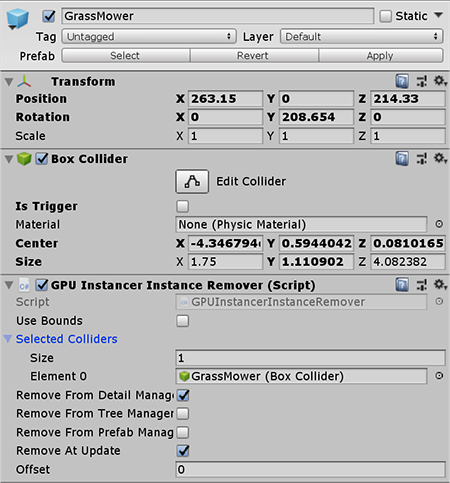 Prototypes show the list of objects that will be used in GPU Instancer. To modify a prototype, click on its image. 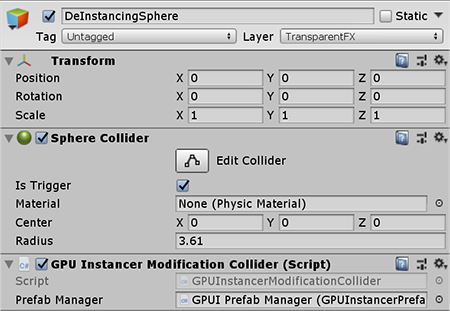 Generate Prototypes: This button can be used to synchronize the detail prototypes on the Unity terrain and GPU Instancer. It will reset the detail prototype properties with those from the Unity terrain, and use default values for properties that don't exist on the Unity terrain. Add: Click on this button and select a texture or prefab to add as a detail prototype to the manager. You can also drag and drop a prefab or a texture on this button, and the Detail Manager will create a texture or prefab type prototype. The manager also adds the new prototype to the terrain as a detail prototype as either a grass texture or detail mesh respectively. Please also note that you can add prefabs with LOD Groups on them - in which case the Detail Manager will add only the first LOD level to the terrain as a detail mesh, but will render the whole prefab with all LOD Levels during play mode. You can selectively turn shadows on and off for individual prototypes in this section. Please note that using shadows in grass prototypes is probably the costliest feature of the Detail Manager. This performance cost also depends on the amount of Shadow Cascades that are defined in the Unity Quality Settings. Is Shadow Casting: This option specifies whether the instances of this prototype will cast shadows or not. Is Frustum Culling: Specifies whether prototype instances that are not in the selected camera's view frustum will be rendered or not. If enabled, GPU Instancer will not render the objects that are outside the selected camera's view frustum. This will increase performance. It is recommended to turn frustum culling on unless there are multiple cameras rendering the scene at the same time. This section becomes visible only when a prefab type Detail Prototype in the manager is selected and the referenced prefab has an LOD Group. Using such prefabs with the Detail Manager is a great way to improve performance further. 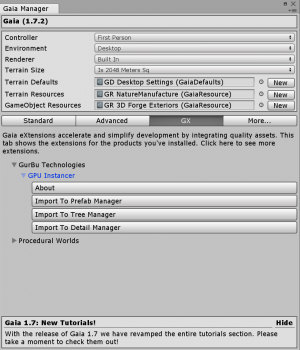 GPUI supports LOD groups on your prefabs and automatically renders them with indirect instancing while managing the necessary GPU buffer automatically. When using such prefabs, the first LOD level is added to the Unity terrain to show the prototype without simulating or entering the play mode. Prototype based Detail Properties can be edited individually in this section for each prototype. The settings here will override their global correspondents. Please note that after you add the Tree Manager, it is recommended to add/remove/update tree prototypes on the terrain from the manager rather than directly on the terrain object. Paint on Terrain: This button can be used to navigate to the Unity terrain component that this manager is referencing. Trees should be painted on the terrain using Unity's native tools as usual. 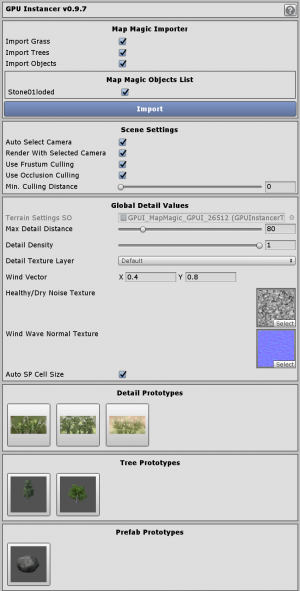 Tree data on the terrain will be automatically detected by GPU Instancer. GPUI also adds a script on your terrain which will show you a button to go back to the manager that is responsible for that terrain. When you are done painting, you can use the Go to GPUI Tree Manager button to come back to the manager. These settings apply to all the tree prototypes in this Manager. GPU Instancer comes with a billboard generator system. A billboard is a simple quad that shows snapshots of the object from different angles depending on the camera viewing angle. GPUI's billboard generator is mainly designed for use with trees so it generates snapshots of view angles around the world y axis. This means that the billboards do not have view perspectives from up or down. For detailed information on GPUI's billboard generator, you can take a look at its section in the Features Page. Billboards are a great way to increase performance while having vast viewing distances. GPUI adds the generated billboard automatically as the final LOD level (even if the prefab does not have an LOD Group on it). You can also use a custom mesh and material for the billboard if you do not wish to use the billboard that GPUI generates. All the billboard settings here can be edited for each individual prototype. For SpeedTrees, GPUI replaces the SpeedTree billboard with the generated one and render it in the original's place. 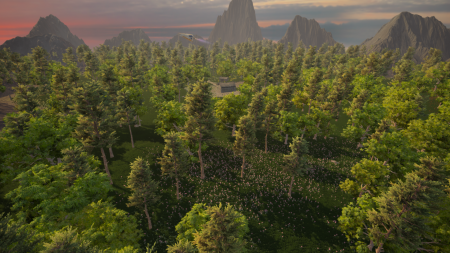 For all other trees, the generated billboard is added as a final LOD level.